Recipe for John Sedlar's Sweet Corn Tamale Dough. Chef Sedlar uses this dough to make his healthy Tamale with Vegetables and Carrot Sauce - recipe included. Heat the corn oil in a saucepan. Add the corn and bell peppers and sauté over medium heat for 10-15 minutes, stirring frequently, until tender. Remove from the heat and let cool to room temperature. Transfer three-quarters of the mixture to a blender and blend for 1 minute -- do not over mix. Add the remaining mixture and other ingredients and pulse until thoroughly combined. 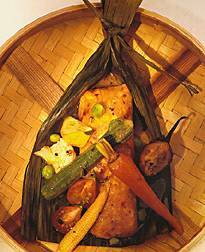 Use this dough to make Chef John Sedlar's "Self" Tamale with Vegetable and Carrot Sauce.